American Roulette offers the worst possible house edge of all the roulette variants available – online and off. This means you’re increasing your chances of losing and unless this is your goal it should be avoided at all costs. We take a look at the reasoning why you should avoid this variation of roulette and alternatives which are much better to your bankroll. 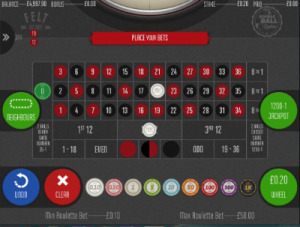 American roulette looks quite similar to standard roulette variations, such as the European layout, but on closer inspection it features an extra pocket on the wheel and an extra betting option on the table. The extra addition is a double zero – so instead of just the numbers 1 to 36 plus a 0, there’s also the 00 option too. While the extra addition sounds like a good idea – giving you more options to bet – it actually raises the house edge significantly. To show you what we mean we compare the two most popular roulette variants and their house edge with American roulette below. 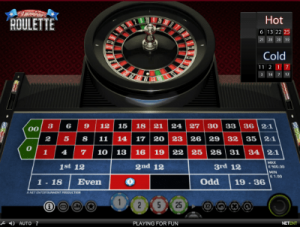 American roulette still follows the basic concept of all roulette games including the types of bets, but there are bets which are only available to this variant. With 38 numbers – 1 to 36, 0 and 00 – available, American roulette offers both inside and outside bets, but there’s an additional bet due to the 00, too. You can place an inside straight bet on this number but this isn’t really that different to a standard straight bet. The unique bet is known as the five number wager, where players bet on 00, 0, 1, 2, and 3 by placing the chip between 0 and 1. This bet pays 6:1, but the house edge is 7.9%. This is higher than the overall game house edge but not by much, proving just how much you should avoid American roulette. If this hasn’t convinced you, take a look at the house edge comparison of other online variants below. 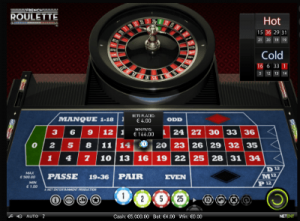 French roulette has the lowest house edge and is widely available to play online. American roulette has a house edge of 5.26%. This is incredibly high for a table game – especially when you compare it to the fact many online pokies have a lower house edge from 2-4%. This house edge isn’t representative of all roulette titles, it is in fact the worst. European roulette is considered to be one of the best roulette variants, featuring pockets numbered from 1 to 36 and a single zero. Due to the lack of the double zero addition, the house edge of this variant is 2.7%. But you can get the house edge even lower with French roulette – the variant has the same number of pockets and layout but it features special rules including En Prison and La Partage which reduces the house edge to 1.35%. These rules involve recovering wagers if the ball lands on zero and therefore decreases your chances of losing overall. Based purely on the house edge, you should always opt for the title offering the lowest as this reduces your chance of losing. If you do like the idea of doubles, perhaps opt for the Double Ball Roulette variant by Felt Gaming instead of American roulette. Double Ball Roulette is a unique variant from the fairly recent software provider, Felt Gaming. The table sees a traditional European roulette layout with just the single zero, but what makes this variant unique is the addition of another ball on the wheel. Regardless of this addition, the title still keeps the European house edge of 2.7%. There’s a minimum of $0.10 and a maximum of $50 for inside bets, and $1000 for outside bets on standard roulette bets. There’s also a minimum of $0.10 and a maximum of $10 on Double Ball Roulette bets. You can then click on the wheel and the screen will transform into the entire wheel. Then click spin and the first ball will start to spin – and you then get to shoot the second ball and wait for the outcome. If this isn’t up your alley you can opt for traditional roulette with an array of European and French variants available online at our recommended online casinos – just avoid the American titles. We recommend Gday online casino for Double Ball Roulette and a huge range of traditional and unique titles too.